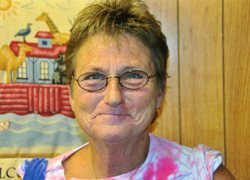 Robin Gordon Norwood, age 59, of Loretto, TN passed away Sunday, September 23, 2018 at her residence. She was a native of Ft. Jackson, SC, retired from Murray Ohio, a member of Noah's Ark Ministry and Meadow View Baptist Church. She was preceded in death by her parents, Samuel and Rosa Nell Williams Gordon; and her husband, Taylor Norwood. Arrangements are being handled by Neal Funeral Home, 231 N. Military Avenue, Lawrenceburg, Tennessee. The family will receive friends from 5:00 PM to 8:00 PM Tuesday, September 25, 2018 at Neal Funeral Home. Funeral services will be conducted at Neal Funeral Home at 1:00 PM Wednesday, September 26, 2018, with Jerry Taylor officiating. Interment will follow at Second Creek Cemetery in Lawrence County, TN. Family suggests memorials be made to Noah's Ark Ministry, Ethridge First Baptist Church, P.O. Box 117, Ethridge, TN 38456.